I recently read this article about how the fear of investing can really cost you. This is such simple and effective advice. Yet when you look at the numbers, most people do not behave in this manner. Most people are intimidated by the stock market and it’s up and down swings. When the market drops, people panic and pull their money out of their 401Ks and other investment accounts in record rates. Yet this ends up costing them thousands of dollars of potential returns in their lifetimes. In 2008, the stock market dropped by more than 750 points in one day. People’s emotions took over their reason; they panicked, and withdrew their money from the market. 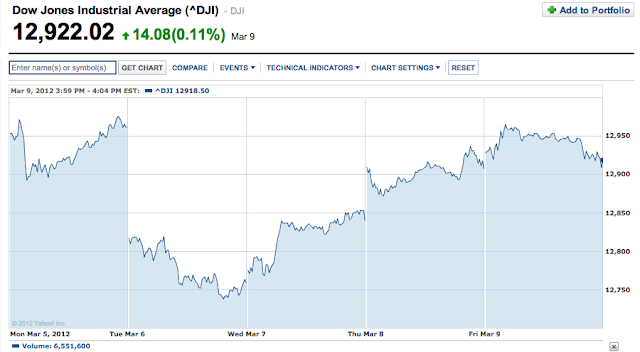 2 weeks later, the market soared over 900 points. Looking back, those that kept their money in the market and continued to invest ended up with huge returns. On the other hand, investors who pulled their money out and sat on the sidelines are missing out on the market currently returning one of the greatest 3 year runs in its history. What we can learn from this experience is that while no investment is risk free, understanding and managing risk can really help you get ahead financially. Smart investors know that the market will always go up and down and see that when the market does poorly, it’s an excellent time to purchase more for less money. Last Tuesday March 6, 2012, the market closed on its weakest day so far in 2012 on concerns of Greece and Asia. The market dropped over 200 points in 1 day. Before the end of the day, I excitedly logged onto Vanguard and put in an extra $400 investment, locking in the bargain price. Two days later, the market bounced back on good news in the economy, and this trade returned over $150. Young people don't invest because they're afraid. Yet, this is the best time to invest, when you won't be retiring for another 25-35 years. When the market drops now, it's like everything's on sale. Who can resist a great sale? BUY LOW, let your investments grow and compound, then SELL HIGH. Investment accounts will make you the most amount of money with the least amount of effort. Have you started investing yet? Or are you still too busy sitting on the sidelines to do it right now? You can start by opening your retirement account. We'll go over other investments in the future. But before that, after setting up your emergency fund, the retirement fund comes next.